John James Audubon ~ The Early Bird! As most of you know who follow my blogs and Facebook page, I’ve been accumulating photographic research material for my relatively new interest in Ornithology. There are certain birds that interest me that I’ve been able to study up close and on a recurring basis. The Great Blue Heron, the Great White Egret, the Night Heron, the Green Heron, and the Snowy White Egret are all birds that I am interested in painting one day. Smaller birds like the Northern Flicker, the Bluebird, the Yellow Warbler and of course Hummingbirds have also recently captivated me. I am excited about painting them. I hope to convey something new in my work and want to capture the sense of wonder that I felt while watching and photographing these beautiful birds. But, it’s all been done before! Long ago, back in the 1800’s a man named John James Audubon challenged himself to paint every species of bird in America. His exhaustive research and prolific lifetime body of work earned him the title of arguably the most famous painter of birds ever. His 474 life-size avian watercolors are in the collection of the New York Historical Society. 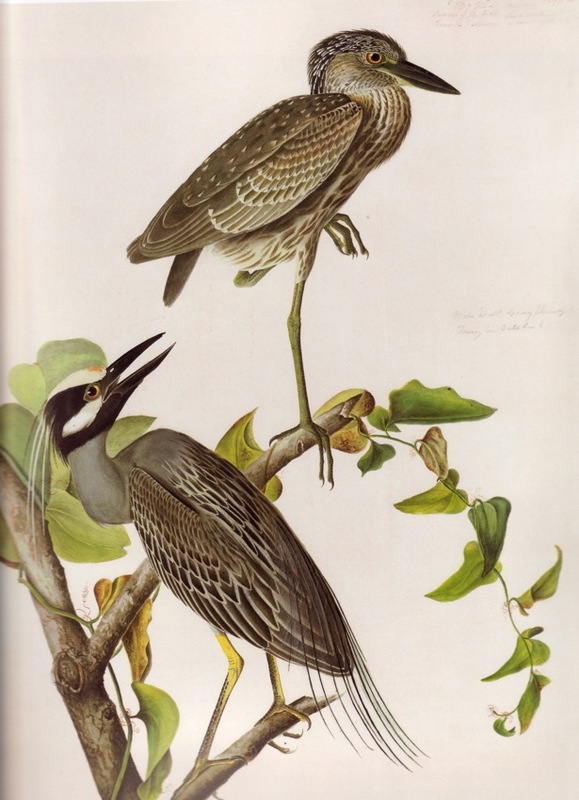 Before I set out on my own journey into the painting of birds, I thought I’d share with you some of John James Audubon’s paintings. I picked these paintings below because they are masterful works representing the birds that I too would like to paint. I find it somewhat humorous that up until this year I had never heard of or seen a Yellow-Crowned Night Heron, much less thought of painting one. But, over a hundred and fifty years ago, someone named JJA was dedicating his life to painting one, along with every other bird in America!!! His work is amazing. Below are just a few of his masterpieces.